Marshall was born in Dayton, NY in May of 1836. 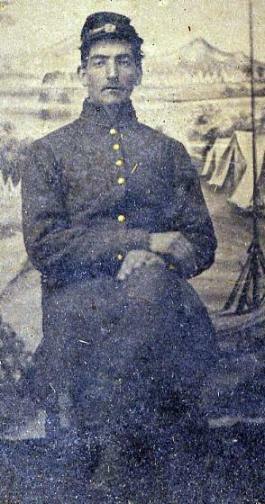 On September 6, 1862, he enlisted in the Union Army and was mustered into the 154th New York. At the time he enlisted he was a carpenter. He founght in many of the major battles of the Civil War including Chancellorsville, Gettysburg, and Chattanooga. At gettsyburg he was captured with many other members of the 154th but was lucky enough to escape and rejoin his regiment. He did receive only one wound and that was while chopping wood. He had cut off several toes on his right foot while chopping wood. This injury would prevent him from joining General Sherman on his March to the Sea. He spent 2 months recovering in the hospital, before he was mustered into the 5th regiment of the Veteran Reserve Corps. After the war, he married his sweetheart, Victoria, and joined GAR Post 403 as a charter member. At age 65 he was given a disability pension of $6 and his occupation had changed from carpenter to painter. On March 18, 1905, Marshall passed away and was buried in the Marshall family plot in the Forest Hill Cemetary, in Fredonia, NY.